Home / Blog / IT Staffing / How to Find a React Redux Developer for Your Team? How to Find a React Redux Developer for Your Team? According to Stack Overflow Report React is one of the most loved technologies among developers (66.9% of respondents) in 2017. Taking this into account, we can assume that the demand for these experts is also very high. Many companies look for the most affordable ways to extend their development teams with such programmers. In this article we have reviewed the common, traditional ways to hire a React Redux developer or hire ReactJS developers vs cost-saving ones. Still, first of all let’s check what Redux is and what salaries React Redux developers get in different countries. The first and most important thing that we should remember is that React is a library primarily meant to provide a better and more efficient method of displaying data on web pages. 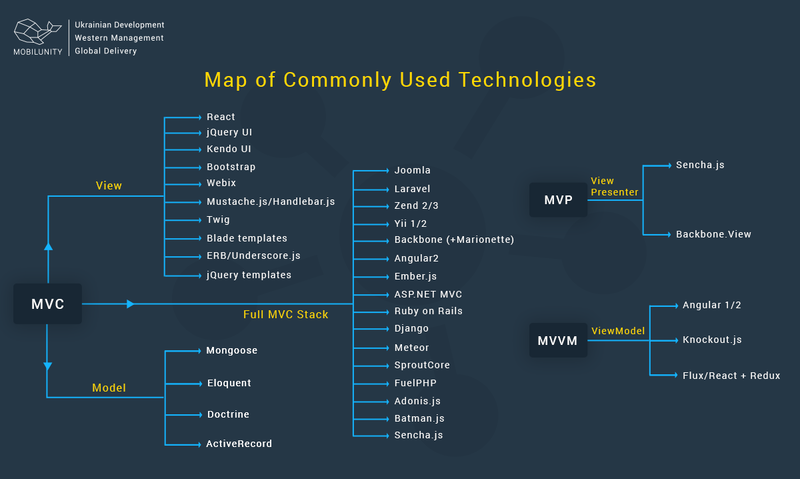 The main benefits of React include: virtual DOM usage for better performance, an improved JSX syntax, and a modular, component-based approach. Due to React’s simple nature, it takes advantage of tools like Flux, Redux, and MobX to build richer client-side applications. It is very easy to maintain simple to-do apps written in React/Redux, but how about big apps with a lot of business logic and components that should interact with each other? In this article, we will discuss some tips and techniques for doing so. Most of these websites and applications are created using Redux and many of the apps, viewers, and frames were also created with the help of combination of several of the following technologies: React Flux Redux. Flux is a pattern used for coordination of an application state and it allows to have separate stores for different types of data. This means that if a developer needs to do any changes in the data, the state won’t be affected. Many experts state that Redux was inspired by this very pattern and is also called “Flux-like”, still, Redux doesn’t have stores and all the changes and actions are done on a state tree. According to Google Trends for the last three years Flux was much more searched for and, thus, is more popular than Redux. In terms of the territorial distribution of the popularity of these technologies: Flux is widespread in Canada, North America, some countries of Europe and India. Redux, in its turn, is also popular in North America. Nowadays, for most JS applications, it is recommended to use new ES6 syntax and features. This may be done in two ways. First, you may configure Webpack and Babel by yourself, but this may prove too complex for most users. Thankfully, React developers from Facebook created a cool command line tool — create-react-app — that is very flexible and provides a development skeleton for a smoother, faster development. Once you have created the base for your future app, your next consideration should be your file and folder structure. There are many ways to organize your files, and these typically depend on the app size. For small and middle-sized applications, you could combine files by structure, so that you have one folder per structure.For example, you can have one folder for reducers, actions, components, containers, utils, tests and so on. When the app is growing, a better decision will be to store them by entity. For example, if you have some components that have appropriate containers, actions, and reducers in store, you could save them in one folder, so that your structure will be more logical. You could notice a correlation between action name and action creator naming, and it’s a good practice because it saves you significant time in the future when debugging and allows you to maintain a solid code standard. Here, we have some action for sending requests and appropriate actions for success or failure. The next important thing to know is the use of containers. This is the point where our React app connects to the Redux store, and there are some tricky issues that we could catch here. One of the best practices here is to use selectors in the mapStateToProps function. Selectors are quite simple; they just get the state as an input parameter and return the required key from the state. They are very useful when you need to retrieve some data from several containers and need just one source of truth. You could also use a library function like reselect to improve your selectors and not ask them to recompute the same data when you need them repeatedly. Again, for performance improvements, it will be helpful to use methods from your library, such as recompose, which calls onlyUpdateForKeys. Redux uses a comparison approach like React, but with some complex data structures, like array of objects, it could cause an issue with container updates and decrease application performance. Also, don’t forget about the way we build components. Try to use class-based components just for containers and components that could handle any kind of additional logic before being rendered. For the rest, you should use functional components. When it comes to type checking, You may use prop-type Facebook packages. o protect your component renders, try to describe in details all possible prop types and their variations. Some optional tools that you may also explore include Facebook Flow or TypeScript, TypeScript may be better in conjunction with Angular, so it may be better to focus on Flow. Last but not the least, you should pay attention to tests. Tests will save your time while debugging your app or fixing any kind of issues. Combining all these techniques depending on the complexity of your project will ultimately prove very useful and beneficial to your project development. A React Redux developer salary is approximately $5,900 per month in the UK. An average React Redux salary is approximately $7,000 in the USA. Junior React Redux developer can earn $8,100 there. Being a country with high living standards Switzerland also offers good rates for React ReduxJS developer. Here they are able to get from $6,300 up to $10,100 a month. At the same time, to hire developers in Ukraine will cost only $1,800 (net salary) according to the PayScale or $2,300-$2,500 as an all-inclusive rate, what in any case will be cost-effective. Although rates of inexperienced developers with Redux skills may be even lower depending on the city. It is very important to know what things to pay attention to before hiring a developer to your project. Here are some web developer sample resumes with Redux skills. Fill the contact form in to get more information about React Redux developer at Mobilunity!